Thanks a lot for your opinion on the Bronze Pot. Now this is probably something you are more familiar with. Could you help me take a look at this bowl? It is my personal collections from a while ago. Thank you very much for your prompt response! 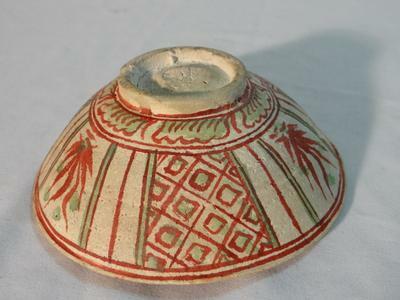 Comments for Ancient Over Painted Bowl? Judging by the picture on the right, it indeed looks as if the red was painted on the rough clay. The question is whether it was fired afterwards or not. Are there any signs of a glaze? There are several things I find contradictory. 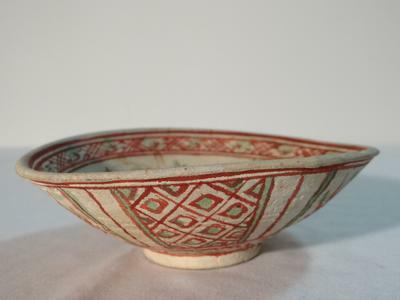 If this bowl is old, then it should be either from the Yuan or Ming dynasty. It would probably be Swatow ware (紅綠彩) from Zhangzhou or elsewhere in the area. These items were export ware. If this is a shipwreck item, then the surface condition would be right, but the roughness means the glaze is gone. Red green decorations of this type were painted on top of the glaze. That means, if the glaze is gone, there would be only a bleached white body remaining. If the body is genuinely old, then it is over-painted as you suspect. Ming bowls of this type are not that rare, but is it Ming? The fish decoration would point to Yuan, but if it was Yuan the foot should show specific features, and it would be rare. For example, the foot rim should be oblique on the outside (wider diameter at the lowest point,narrower where it is attached to the bowl body). There should also be a small cone in the center, from production. Unfortunately, the bowl foot is not in the best condition to recognize this from the pictures. So, given that the body is old, it can only be said that the bowl indeed was over-painted in more recent times. 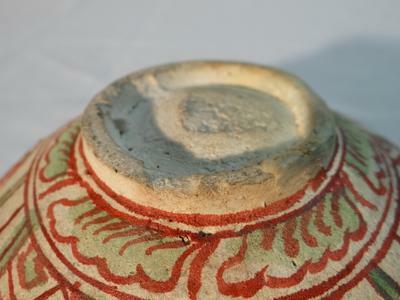 What could be done is to check if the bowl was fired after the painting. This could be done by wetting a cotton stick with water, white spirit or acetone, etc., and check in some inconspicuous place whether the color does get diluted. If it does, then this is a fake antique, in my view. 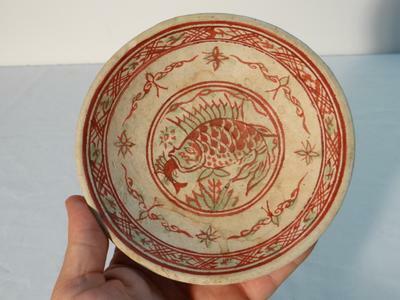 If the fish decoration did indeed exist in the Ming dynasty, I still have some doubts, though. I　ｆｒｅｑｕｅｎｔｌｙ　ｓｅｅ　Ｍｉｎｇ　ｉｔｅｍｓ　ｏｆ　ｔｈｉｓ　ｒｅｄ　ｇｒｅｅｎ　ｔｙｐｅ. Mostly they show abrasion of the decoration. Those which don't have abrasion signs were frequently repainted, with no parts of the color missing. I believe that many old red green bowls which have decorations in bad shape are repainted, probably for a market which has a great desire for these items: Japan.